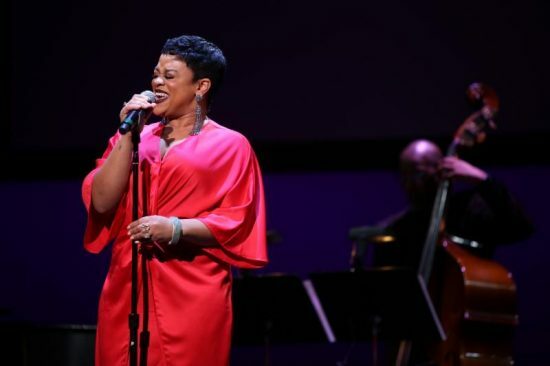 Laurin Talese is the winner of the 7th Annual Sarah Vaughan International Jazz Vocal Competition, also known as the SASSY Awards. At the New Jersey Performing Arts Center (NJPAC)’s Victoria Theater on Nov. 18, Talese took home the contest’s top honors over four other finalists. The five singers had been selected from more than 600 submissions through three public rounds of online voting. For the final round, Talese and the other four singers—Russia’s Oleg Akkuratov; Hartford, Conn. native Toscha Comeaux; Californian Gabrielle Cavassa; and Australia’s Olivia Chindamo—performed in front of a live audience and a panel of judges including vibraphonist/composer/educator and NJPAC artistic advisor Stefon Harris, vocalist Nnenna Freelon, trumpeter/composer Jon Faddis, WBGO radio personality Sheila Anderson, and Mary Ann Topper, president of the Jazz Tree, Inc. artist management company. Contestants were judged on vocal quality, musicality, technique, performance, individuality, artistic interpretation, and the ability to swing. As the first-place SASSY Award winner, Talese receives $5,000 cash as well as a guaranteed performing slot at the 2019 Newport Jazz Festival. Akkuratov, the second-place winner, was awarded a $1,500 cash prize, and Comeaux, the third-place winner, received $500. Talese, a native of Cleveland, earned a bachelor’s degree in jazz vocal performance at the University of the Arts in Philadelphia. She has worked with such recording artists as Bilal and Robert Glasper and has shared the stage with the Cleveland Orchestra, the Moses Hogan Chorale and the Mozarteum Orchestra of Salzburg. Her 2016 debut album, Gorgeous Chaos, features appearances by Glasper, Josh Lawrence, Christian McBride, Christian Sands, and other jazz notables. Past winners of the SASSY Awards—which are the concluding event of NJPAC’s TD James Moody Jazz Festival—include Cyrille Aimée, Jazzmeia Horn (also winner of the 2015 Thelonious Monk Competition), Ashleigh Smith, Arianna Neikrug, Deelee Dubé, and Quiana Lynell.